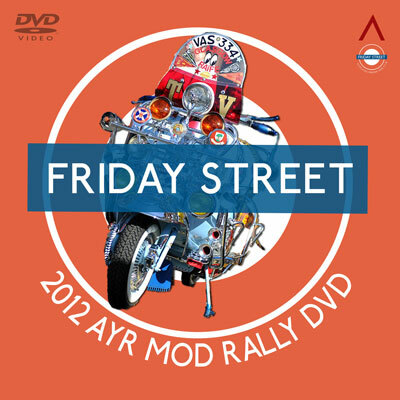 If you want to see how technology has moved on and become more accessible, the arrival of a DVD of the 2012 Friday Street Mod Rally To Ayr is a shining example. Usually after an event, there are a few comments online, along with a selection if photos – people holding pint glasses, the dancefloor and a rows of scooters outside. Not this time. The May event was professionally filmed during the Saturday by the Production Attic Film Company. 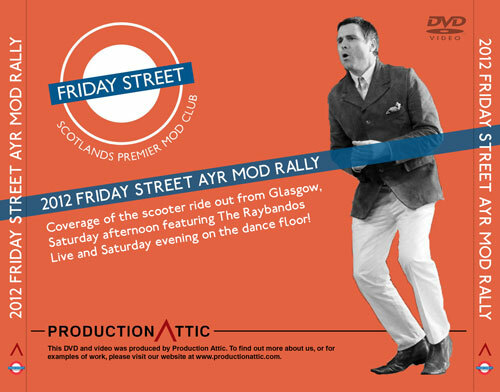 The footage on the 45-minute DVD includes the scooters meeting in Glasgow, coverage of the Scooter ride out to Ayr at various locations, the scooters arriving in Ayr, general afternoon footage inside and outside the Station Hotel, along with Glasgow band The Raybandos playing live and the Saturday evening dancefloor. The DVD is also soundtracked by The Beat Movement and the packaging is what you see on this page. If you want a copy, the DVD plays on all regions and is priced at £8 plus postage. That is £2 UK, £4 for Europe and £6 for the rest of the world. Payment as a gift via Paypal to: [email protected].